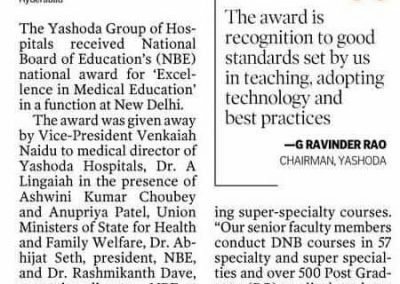 Hyderabad, 24th September, 2018: Hon’ble Vice-President of India Shri Venkaiah Naidu presented this prestigious DNB National Award to Yashoda Hospitals Group on Friday, the 21st Sep 2018 at Vigyan Bhavan, New Delhi. 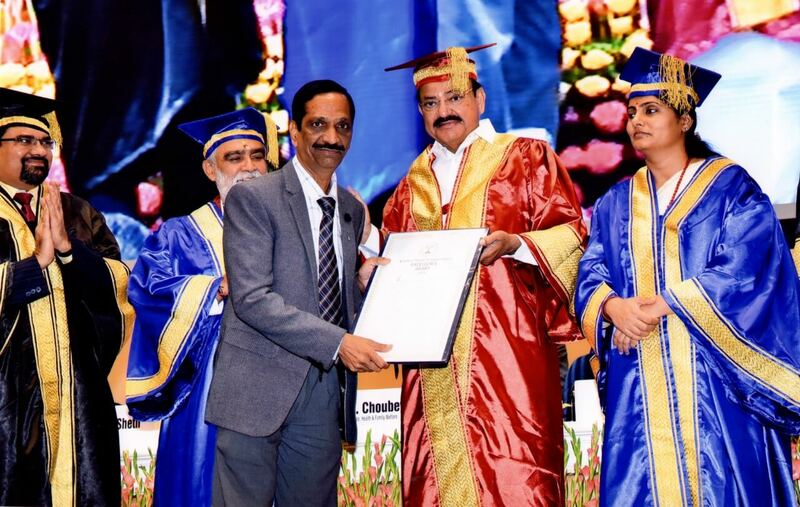 Dr. A. Lingaiah, Medical Director of Yashoda Hospitals Group received this national award from the Mr. Venkaiah Naidu, Hon’ble Vice-President of India. 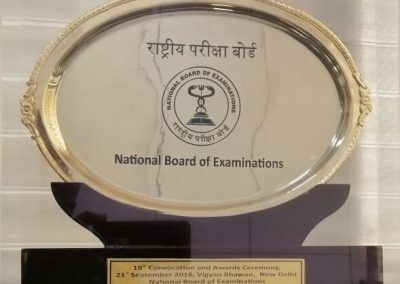 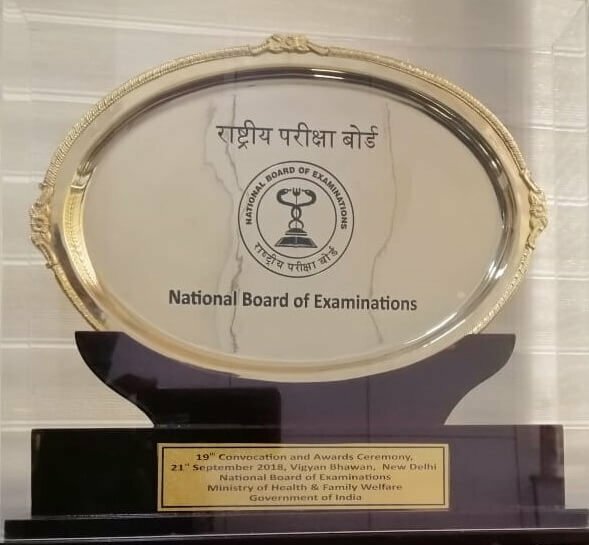 The award was given away in the presence of Ashwini Kumar Choubey and Anupriya Patel, Union Ministers of State for Health and Family Welfare, Dr. Abhijat Seth, president, NBE, and Dr. Rashmikanth Dave, executive director, NBE, a press release said. 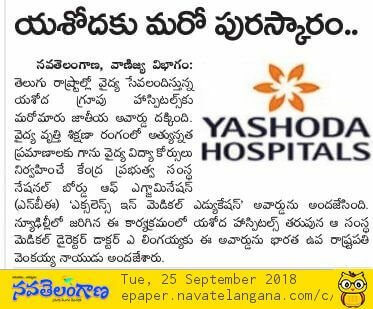 “Yashoda Hospitals is one of the leading Healthcare Provider & Medical Education Institution in India Conducting DNB Courses in 57 specialities & super specialities with 500+ PG medical students. 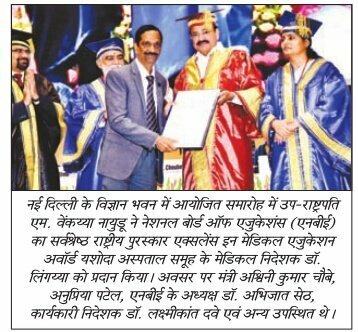 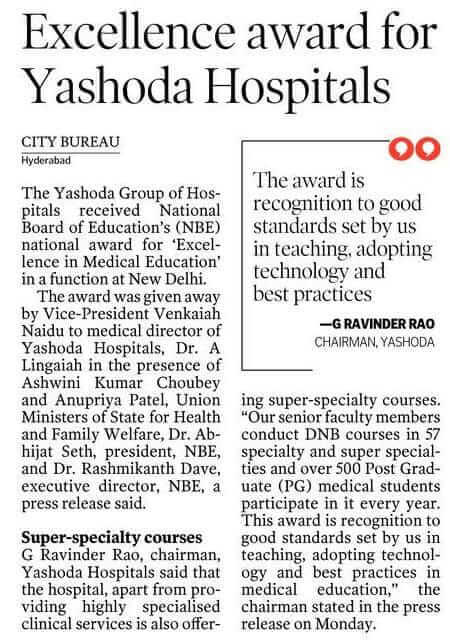 This prestigious National Award is a recognition towards best standards, teaching, technology & practices of Medical Education initiatives of Yashoda Hospitals. 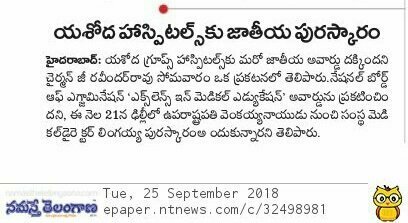 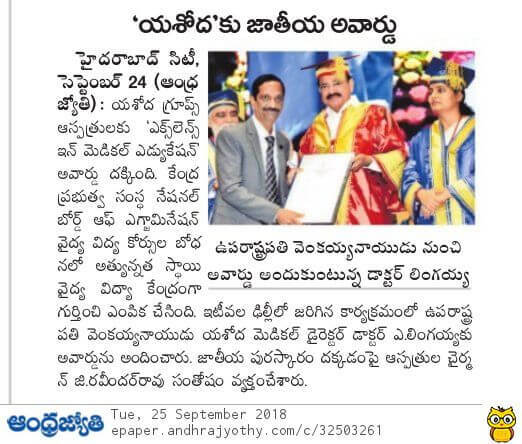 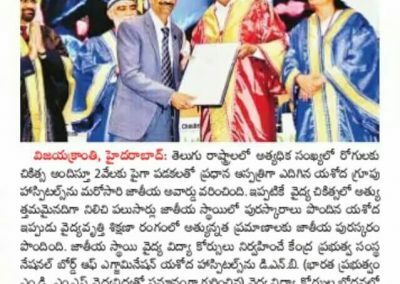 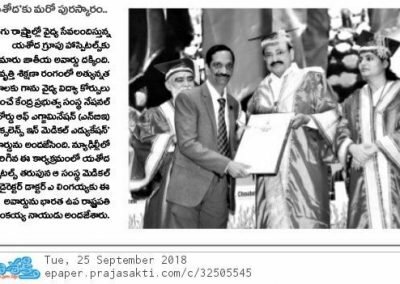 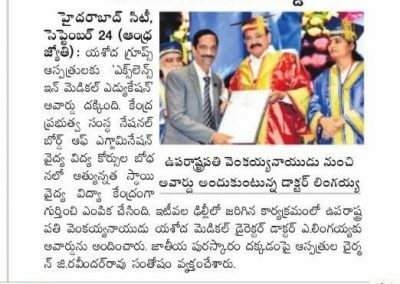 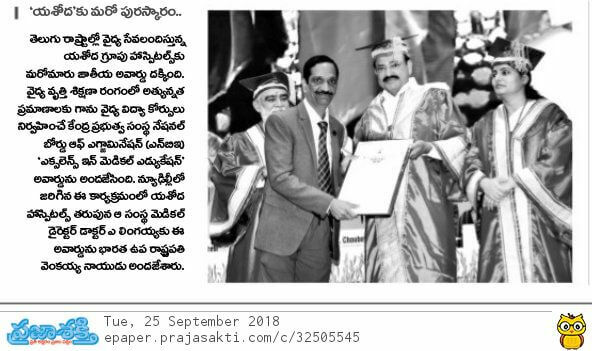 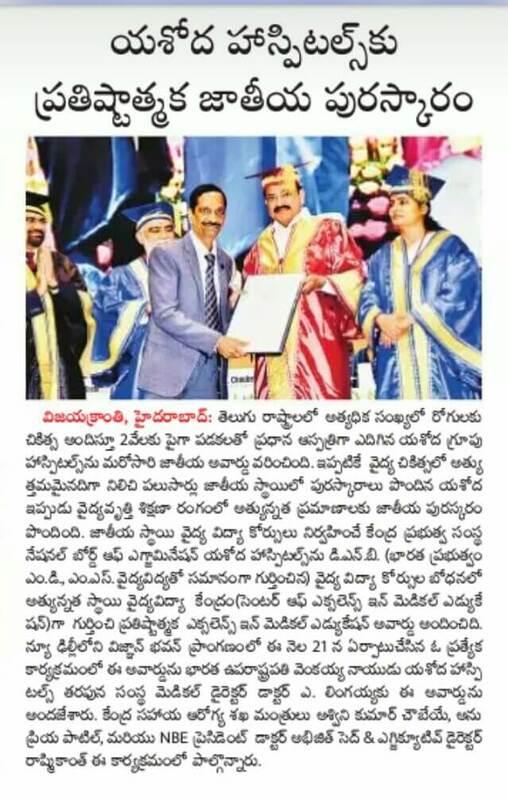 It is an honour & pride not only for Yashoda Hospitals but for both the Telugu states in terms of highest standards of Medical Services Education & Training.” said Sri G. Ravinder Rao, Chairman of Yashoda Hospitals Group.